The history of the Church and the building the Kingdom of God didn’t stop in the 1800’s. It continues in our day – and some of the most poignant examples of this is in the history of how the Church has been built in Boston. Clayton Christensen and his colleagues spent over a decade interviewing, collecting, documenting, and sharing the powerful miracles that were happening throughout New England. Gathered into this book, you will find stories of dedication that will inspire deeper discipleship no matter where you are serving. Clay invites you to purchase and read this book. You almost can’t read a chapter without weeping at the tender and approachable men and women you will meet in its pages. Clay then encourages you to invite your friends who love and are drawn to Boston, to do the same! After reading For All the Saints, I felt as if I had walked and talked with some of the finest disciples who have lived and worked on the earth. . . . This thoughtful and well-written book is a spiritual record that is relevant and of great value today. It confirms the divine nature of mankind, reveals the hand of the Lord in individual lives, and establishes the direction of righteous and happy living. 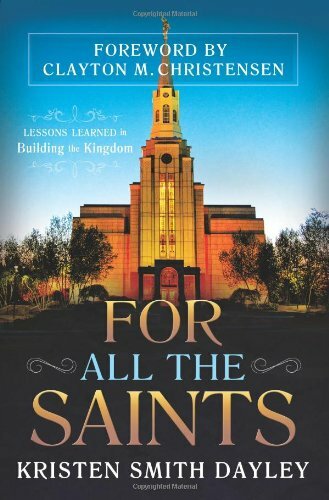 A deeply touching and inspiring book, For All the Saints illustrates the remarkable conviction and courage of Latter-day Saints in New England. It provides a unique window into the lives of countless and unassuming individuals and families, whose steady acts of faith, service, and perseverance have created an extraordinary heritage and a miraculous harvest. For All the Saints is available in hardcopy and electronic version at Deseret Book, Seagull Books and a number of online resellers, including Amazon.com and Barnes and Noble. For more information, go to www.forallthesaintsbook.com.